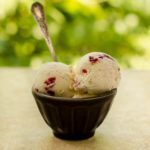 A recipe for Cherry Cream Cheese Ice Cream, made old-fashioned churned style with half-and-half, sugar, egg yolks, cream cheese, cherries, and vanilla. Place the cream cheese cubes and vanilla in a large bowl. Whisk together half-and-half, sugar, and egg yolks in a saucepan. Cook over medium heat, stirring constantly, until mixture reaches 175 to 180 degrees Fahrenheit. Pour heated mixture through a strainer into the bowl with the cream cheese. Whisk until combined and smooth. Place plastic wrap directly on surface to prevent a skin from forming. Cool to room temperature then chill overnight. Pour mixture into an ice cream maker and freeze according to the manufacturer's instructions. Stir in chopped cherries. Transfer ice cream to a freezer safe container. Freeze for at least one hour before serving. Time stated does not include cooling and chilling mixture overnight.